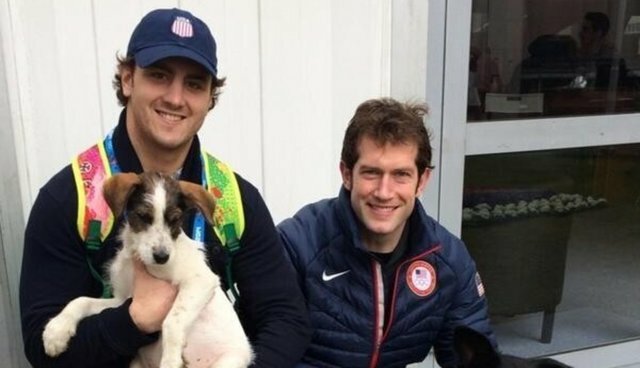 Members of the U.S. men's Olympic hockey team are going forward with their plans to adopt stray dogs from Sochi. Ryan Miller, the team's starting goalie, tweeted a picture of a dog at their hotel on Tuesday, and two others -- right winger David Backes and defenseman Kevin Shattenkirk were pictured with puppies they'd picked out, too. Backes told USA Today, "They kind of were portrayed a little bit as rabid animals that were dangerous. I don't know if anyone's seen that out of those animals. I think you've seen a lot of friendly, smart street dogs that have perhaps have had a tough life and had to find ways to get food and shelter and water and all that good stuff." No word yet on whether Olympic skier Gus Kenworthy, who made headlines for trying to adopt Sochi strays as well, has offered some help after Backes tweeted him about it. But Barkbox, a service that delivers a monthly package of pet products, has offered even more incentive (below).